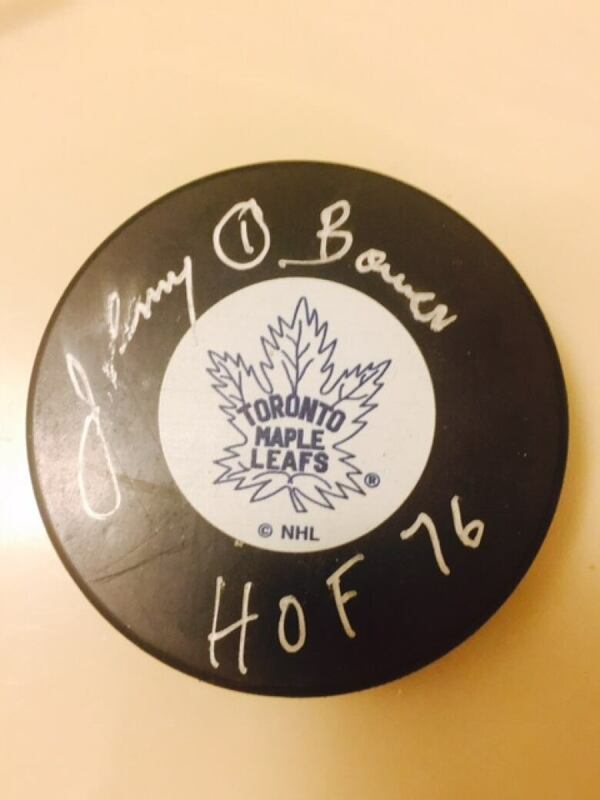 To most, it was his hockey that made Johnny Bower a legend. To those whose lives intersected with the Hall of Fame goaltender in the Mississauga/Oakville neighbourhoods where he lived, his legend came from kindness and humility. And Johnny Bower trusted Tony Baggetta. The Maple Leafs legend, who died Dec. 26 at the age of 93, first met Baggetta in the fall of 1961, when he was cutting hair at the Royal York Plaza in Etobicoke. Ten years later, Baggetta opened Anthony's Family Hairstyling inside the Woodchester Mall on Dundas Street in west Mississauga. There are not a lot of pictures on the wall, but one stands out. A young Baggetta standing beside his barber's chair with the Leafs goalie smiling for the cameras. Bower eventually west to Oakville, but remained a regular until Tony retired in the fall of 2015. 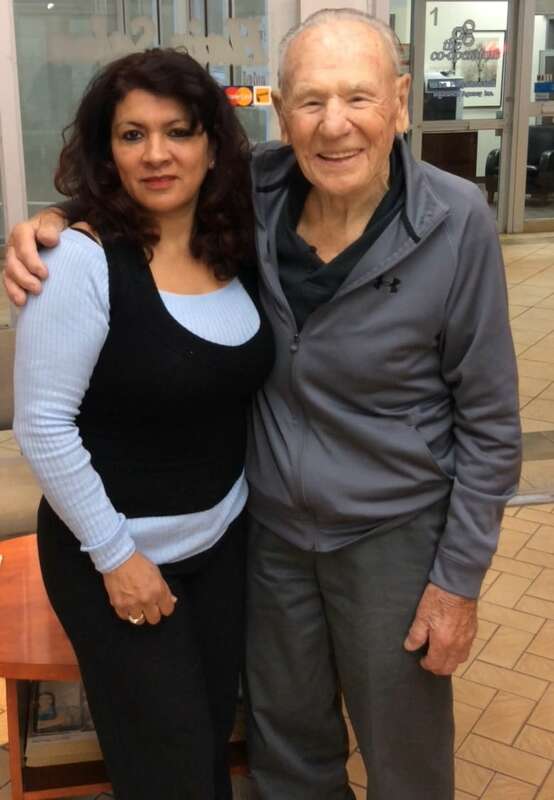 "Johnny Bower was one of the nicest men to ever come into the store," said Rosemarie, Tony's wife. "He had zero anger, he was always smiling and he was such a great guy. He was such a generous man. He always gave of his time. People he didn't know would ask to have their picture taken with him and he would say, 'Of course.'" Constable Todd Clark, 44, is in his eighth year on the job with the Peel Regional Police. One Sunday this summer he was assigned to work a charity event, and remembers how he "assumed that it was going to be a bad chore." Instead, he was assigned to drive Bower to a charity torch ride for Special Olympics and then bring him home. 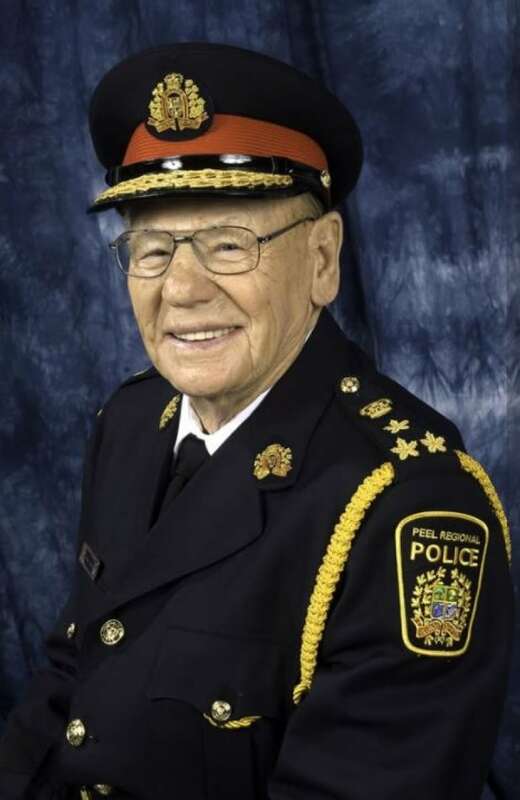 Bower deserved the special treatment since he was a) the force's first and only honourary chief in the 40-year history of Peel Regional Police, and b) he was Johnny Bower. As honourary chief, Bower was given the same dress uniform as the official chief. A Peel honour guard was there for Bower's funeral. "I assumed he was living with his daughter, but Mr. Bower answered the door and was pretty spry for a 93-year old," Clark said. En route, Bower asked Clark questions and Bower told stories. Like the one about when Bower stole his old cotton Maple Leafs jersey after the final game of a season. Clark remembers Bower telling him that former Leafs owner Harold Ballard came by to collect the players' jerseys, and in Bower's mind, "I never took anything from them and they never gave anything to me." As Bower told it, "Just as he gets near me, a writer walks by, Ballard started swearing at him. [I] hid the jersey, went to the showers and then left." The next day Ballard phoned Bower asking, "Where's your jersey?" Bower told him, "I gave it to you when you were yelling at the writer." Ballard, unsure of what really happened, then let it go. Bower told the constable that Eddie Shack would ask players to sign his cowboy hat, then sell it for $200 and how Bower's wife, Nancy, banned Shack from the house. "Mr. Bower said Nancy wouldn't let him in the house because he would use four-letter words and drink our wine, so any time Shack came over, Mr. Bower would stand and talk to him in the driveway," Clark recalled Bower telling him. Bower told Clark of attending a charity event with Mississauga mayor Hazel McCallion. The mayor would take five shots and if she scored the charity was the winner. However, Bower had a stick and zero equipment, while McCallion was shooting one of those hard, orange balls. And Bower was not wearing a jock and, of course, that is where he was plunked. He allowed the last shot to get past him. And Bower told Clark how, if he would "let in a stinker of a goal," defenceman Tim Horton would chew him out. "Mr. Bower said it was only years later that he found out that [Horton] had a bonus for the total number of goals against." At the Special Olympics event, Bower sat in a chair, posed for pictures and gave out autographed coloured pictures. "Any time a woman would come along, he would demand to stand up," Clark said. "He was such a gentleman the whole day." Then deputy chief Brian Adams brought the group together and recognized "one of the best goalies of all time." As Bower headed toward the podium, people clapped and it quickly turned into a standing ovation. "You should have seen Mr. Bower light up," Clark said. "He had been shuffling all morning, but he walked to the podium with a purposeful stride and his face lit up. His first line was, 'I didn't get a hand like that at the Gardens.'" On the drive home, Clark told Bower that he also was a goalie. "Were you any good?" Bower asked. "Well, Mr. Bower, I had a different strategy, I let the net stop most of my pucks," Clark said, eliciting a laugh from the Hall of Famer. Clark also worked as a referee, and any time Bower was there for a ceremonial faceoff, he would drop by the referee's room. "He'd come in with signed pucks and give each official a puck," said Clark, who admits he is a Philadelphia Flyers fan. "Mr. Bower treated our service really well," Clark said. "He was not a celeb, just a good down-to-earth man. He was an old school gentleman. It's kind of a cliche, but they don't make them like that anymore." Anthony's Family Hairstyling was sold to Marlene Carrasco 2016. And soon Carrasco had her picture taken with Bower, framed and posted on the wall. So, outside of a few months, Bower's picture has been hanging from a wall every day inside the shop since 1971 as Cheryl, Big Tony, Luanne, Rose, New Tony, Ron, Johan, Tammy and others went about their work. And it will still hang there now that Bower has passed away. Carrasco admits she knows more about soccer than hockey. "I did not follow hockey too much," Carrasco said. "But Johnny Bower was so famous. He was with the Maple Leafs the last time that they won [the Stanley Cup.] He was our VIP. He was so nice, so famous. People would stop, ask him to have a picture taken with him." Carrasco said Bower was a regular until a couple of months ago. "The short time I was lucky to meet him it was an honour, he let me take his picture," she said. "Such a nice sweet man. He would give us a hug when he came in the shop. I was upset when I heard he passed, We had heard that he was not doing well." Bower's picture hangs in such famed places as the Hockey Hall of Fame and the Air Canada Centre, fitting tributes to a legendary NHL career. And just as fitting is its place in Anthony's Family Hairstyling, and in the many living rooms and offices and thousands of other places where Leafs fans live and remember.